Ever wonder where this phrase came from? If you said Alice in Wonderland, well, you'd be...wrong. According to language maven Richard Lederer, the phrase predates Lewis Carroll's famous book. "Charles Ludwidge Dodgson," Lederer writes, "best known to the world as Lewis Carroll, popularized the Cheshire cat in his children-of-all-ages classic, Alice's Adventures in Wonderland (1865). The Cheshire cat in the story gradually faded from Alice's view, its smile being the last part of the animal to vanish. 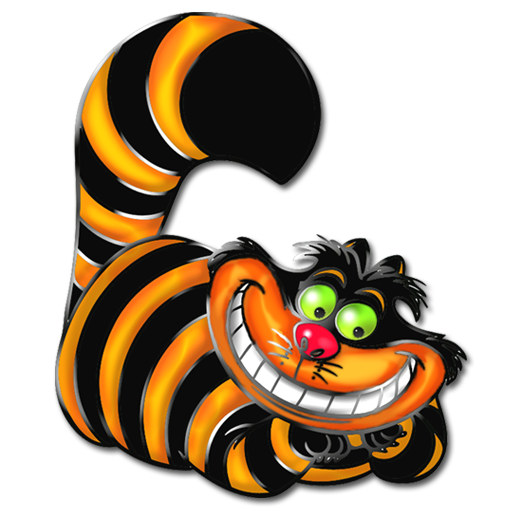 To grin like a Cheshire cat goes back before Carroll, and the source could be Cheshire cheeses, which were at one time molded in the form of a cat. Another theory contends that the cat grins because the former palatine of Cheshire once had regal privileges in England, paying no taxes to the crown." We just learned something new from you! Methinks many of us were grinning like a Cheshire cat after Christmas. Have a terrific Thursday. Wow! That is a very old saying! Thanks for the trivia and Happy Thursday! We kept looking at that cat because it kinda looked like a grinning scorpion! Now my human wants a Cheshire cheese cat! ...unless of course it's Waffles Too who's smiling. Evil lurks beneath HIS grin. Allie: Oh you are SO right. I started growling at Faraday a bit ago, and he looked all innocent - but I KNEW what was lurking in his thoughts! He might have been just sitting there, but *I* knew! Fascinating! Especially since the Alice stories were also parodies of the English political system, as so many English stories turn out to be. Btu for once a happy cat story! Maxwell: Cody, dood! For realz? COOL! Well, we didn't know that!! Now we are eddicated! We didn't know that but we do like Cheshire cheese. We love the Cheshire cheese, a lovely cheddar. Cats love it too! TBT here: The Palatine Hill was where Romulus and Remus (founders of Rome) were nurtured by a she-wolf. Palatine is the Latin origin word of "palace", and a "Palatine" was a high castle official. In later centuries, a Palantine managed an outland area for the castle lord. Much as "sheriff" comes from "shire-reeve", the person who enforced laws in an English Shire. Sorry, I get off on this stuff sometimes... Now, back to the cats. Cats: We LOVE Cheshire Cat and wish we could do HIS trick of disappearing. We try and try, but it seems we allus leave a tail or paw hanging out! Ooh, thanks for telling us! Wikipedia was not much help when we tried researching the whole Palatine thing! Oh, and thanks for using both Palatine and Palantine. We got really confused when they seemed to be interchanging those! Cheeses molded in the form of a cat? They don't have that in France, only stinky cheeses! Darn. Mark's Mews beat us to the Palatine Hill story. We like Palatino font ;-) Hello, non sequitur! Grinning is my favorite pass time! We love trivia! Thank you. Purrrrrrrrrrrrrrs.